FREE DOWNLOAD FOR YOU: When You Buy this BOOK you get the powerful track "GOD OF HOPE" -- Get This FREE Worship Download on High Quality MP3 Today -- (Instructions Inside). 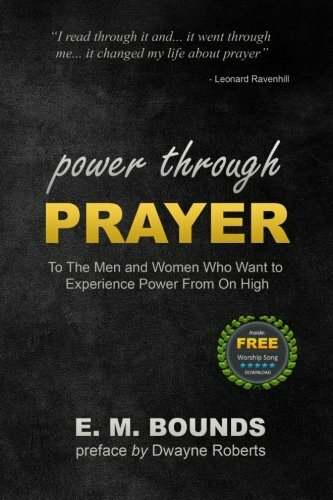 Actually, people love reading our SPECIAL EDITION (of "POWER Through PRAYER") because we use bigger fonts and a lot of visual space between paragraphs (Something very hard to find on classic works). BRAND NEW PREFACE written by Dwayne Roberts, from the International House of Prayer. About the AUTHOR: E . M. Bounds (1835-1913), a Methodist pastor and devotional writer, born in Shelby County, Missouri. He wrote some of the best books on prayer the world has seen. About the PUBLISHER: Open Heavens Publishing is in the business of helping people encounter the presence of God... presenting the principles of Jesus through the written word. We select every book thinking of... what would best equipp YOU to KNOW and EXPERIENCE GOD.